It's time to wrap up Week One's Christmas Characters with a post on how many of them I use in my decorating and/or have we actually visited any of them. 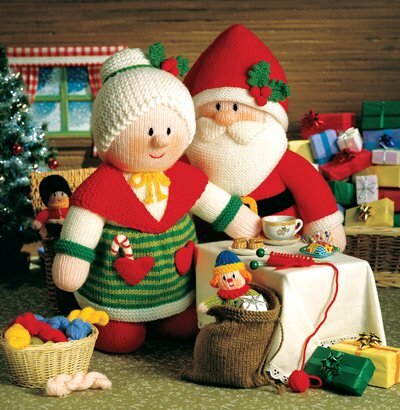 The knitted Santa and Mrs. Claus Mum made for me - this is a stock photo from Jean Greenhowe but mine look exactly the same. I was tickled in 2013 when Sophia moved Edward, our Elf on the Shelf, from where I placed him for her surprise one morning to a complete surprise for me! I don't have a photo of the Grinch or of a penguin but I know I have ornaments for both. Maybe this is the year I complete my photo ornament inventory. The surprise for you is the best. And the snowman was built by a perfectionist. Love it. I think I like Vic's snowman better than the three ball version! Your hubby's snowman is great! And I love the Santa and Mrs. Claus that your mum knitted for you. She did an amazing job. They are really cute! Love the Mr. and Mrs. Claus. Great snowman Vic did.